Disney has announced the upcoming Marvel series for Netflix will film primarily in New York, representing the largest film or television production project commitment in the state’s history. 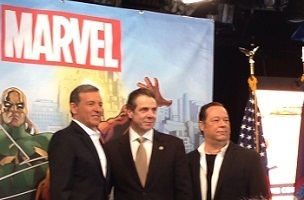 Speaking at a press conference with Governor Andrew Cuomo this morning, Disney CEO Bob Iger said New York was “aggressive” in pursuing the company’s business — and that authenticity was very important to the project. The series will focus on Marvel’s “flawed heroes of Hell’s Kitchen”: Daredevil, Jessica Jones, Luke Cage and Iron Fist. 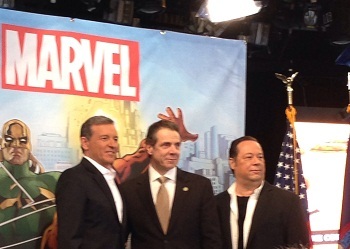 “It’s very, very important for us to be in New York,” Iger said from ABC’s studios in Times Square. The series will begin filming this summer and will debut on Netflix in 2015. The finished product will include nearly 60 episodes and is expected to create at least 3,000 jobs in New York, including 400 full time jobs, according to a statement from Disney and New York State. The Wall Street Journal reports the deal includes incentives worth about $4 million. Last year, Netflix and Disney inked a distribution deal that gives Netflix exclusive rights to Walt Disney Studios movies, including titles from Disney, Walt Disney Animation Studios, Pixar Animation Studios, Marvel Studios, Disneynature and Lucasfilm.